Addiction treatment isn’t something that people should take lightly. In fact, it takes a wide range of programs to uncover the root cause of an addiction. At Woodlands Recovery Centers, we understand the need for alternative treatment methods. In fact, we offer experiential therapies such as art therapy to help our clients overcome addiction. Art therapy involves the use of artistic expression to promote productivity and health. Therapists use the art that people create as windows into their subconscious. The topics that they aren’t comfortable talking about often come out in their artwork. Keep in mind, however, that this type of therapy doesn’t replace evidence-based treatment methods. People still need other therapy such as individual, group and family therapies. Art counseling, however, is a great way to make progress quickly. Drawing is typically the first type of art counseling that comes to people’s minds. However, it can include painting and sculpting as well. 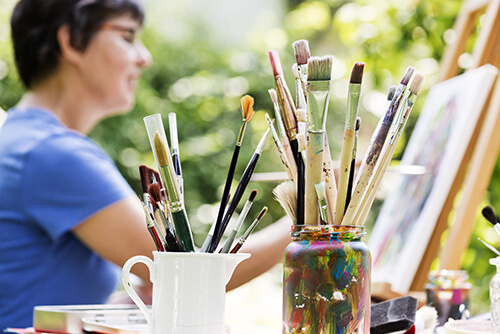 People typically think of art counseling as a one-on-one experience. However, it has applications in both individual and group sessions. Dancing and acting are two common types of group art counseling. At Woodlands Recovery Centers, we use both individual and group art counseling sessions. Other types of art counseling might start off as one-on-one sessions and then evolve into group sessions. For example, people typically write poetry and music alone. However, it’s common for them to share their music and poetry in groups. This approach helps them share their feelings and thoughts more freely. Why Do Therapists Rely on Art Counseling for Addiction Treatment? Therapists count on art counseling to help people express their thoughts and feelings. Sometimes, they have trouble putting how they think and feel into words. Art counseling gives them a different outlet. Studies show that art therapy is particularly beneficial for people with underlying mental issues. Opening a path of nonverbal communication is a great way to get people to open up. They often don’t even notice that they become more open. Our programs are available in durations of 30 to 90 days. Offering different program lengths allows us to provide treatment to those who need more time to recover. Learn more about therapy services today by calling (855) 752-3377.